This week was a huge grocery purchase week. We are now well-stocked on just about every staple, we have oodles of fruits and veggies, and if I want to, I can make my Real Food “Velveeta” and Rotel Dip every day for a month. I hardly ever get to go to Aldi. I price-match from their ad every week, but actually going to the Aldi store is rare for me since the nearest store is an hour away. Therefore, I get a little bit ridiculous when I do get to go. I bought two cases of their version of Rotel. 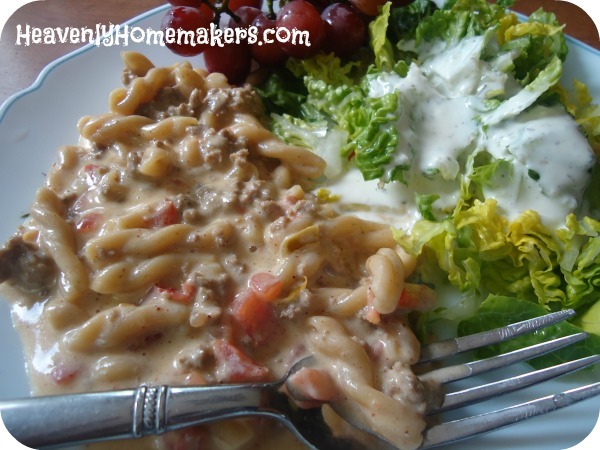 It’s a must-have so I can make the above mentioned dip, as well as this amazing Spicy Mac and Cheese. 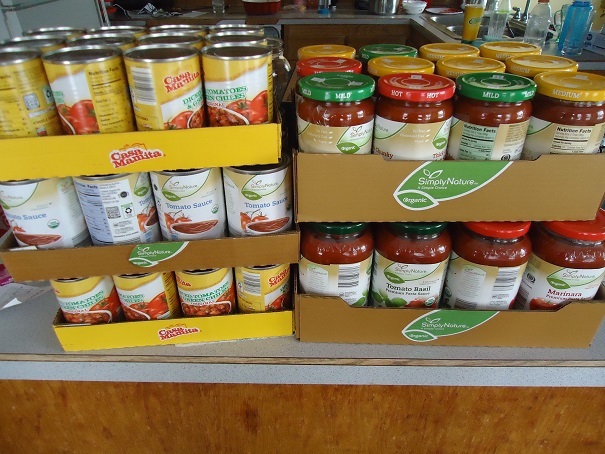 I also bought a case of pasta sauce and a case of tomato sauce. It was a cart full of tomatoes. You want this recipe too. 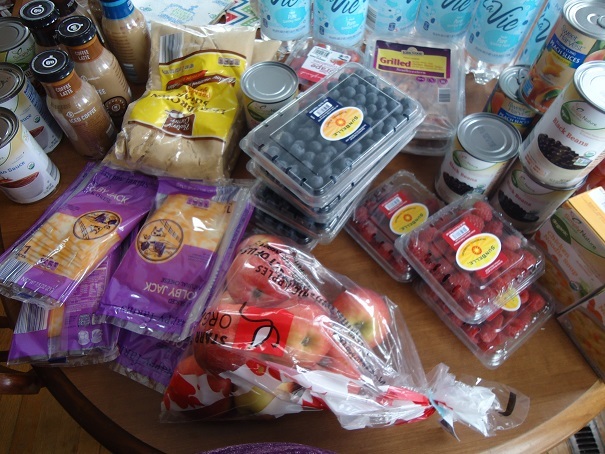 In addition, I bought several cans of beans, peaches, and some specialty coffees for my family as a treat. I bought grilled chicken and prepared soup for Asa’s dorm fridge. I grabbed sliced cheese, apples, grape tomatoes, raspberries, and blueberries. Oh, and that sparkling water? It was a great price so we bought a case of that too! The boys have had fun lately making this Sparkling Juice Drink, so we took advantage of the price. You’ll also see brown sugar in the picture. You can read more about that here. I had just come off an enormously busy weekend, then made this trip to Lincoln – so had made plans to take Tuesday off to rest and refresh. 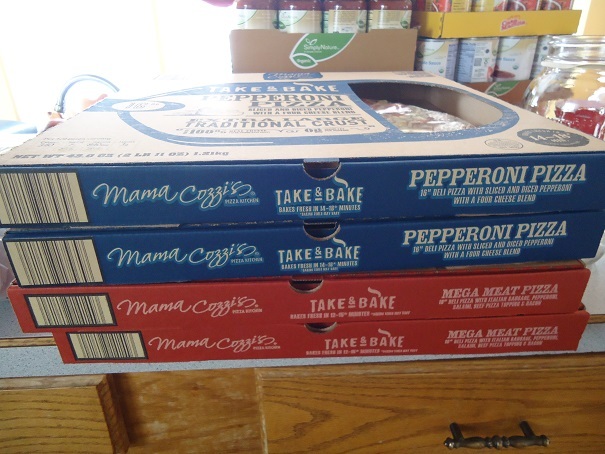 Therefore…pizza. It’s a fun treat, we ate fruits and veggies with it, and I’ve determined that if you don’t read the ingredient list, it isn’t nearly as harmful to your health. (Don’t listen to a thing I say.) Resting on Tuesday was marvelous. The pizza was so-so. Later in the week, I went to Walmart to do some price-matching because I can’t not stock up when there is a good price on food we love. I bought no less than 18 boxes of cream cheese. Dude. It price matched for $1.18 and I had nine coupons to get $1.00 off two. 68¢ for cream cheese? Yes. Times 18. We will easily use it all before it goes bad. 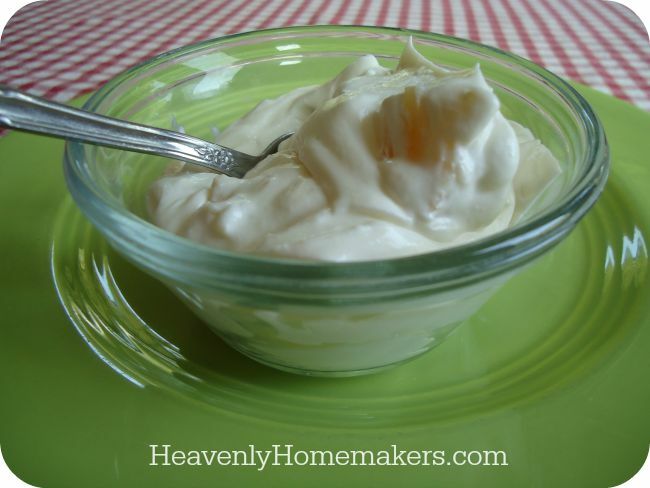 Pineapple Fluff Salad is a favorite cream cheese user-upper at our house. 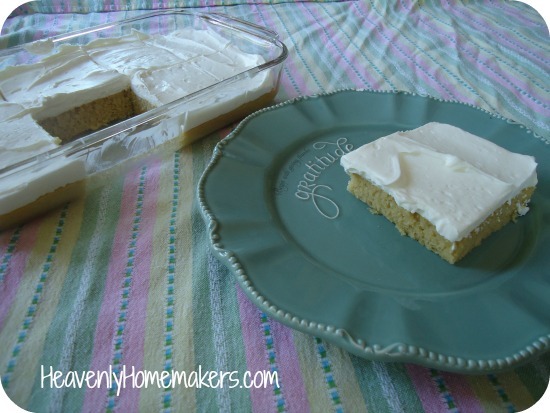 It goes without saying that Stevia Sweetened Cream Cheese Frosting is amazing. Enough about cream cheese. 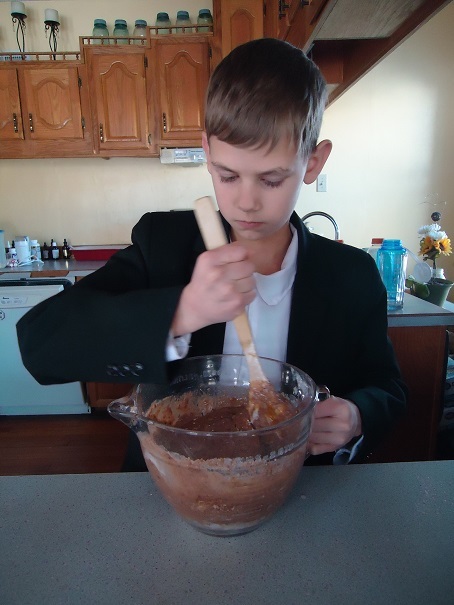 You want to see my 11-year old chef. He doubles as an FBI agent, thus the suit. He and I ate up (kind of but not quite literally) the free Knife Skills for Kids course. Then we started working our way through Katie’s Kids Cook Real Food Course. I will admit to you that when Katie from Kitchen Stewardship emailed telling me about her new eCourse, I got a little sad. Wait! thought I. I wanted to put together a kids’ cooking eCourse! But then I quickly turned around and realized, Dude! Katie did all the hard work! Your job here is done. Boom diggity, check that off the to-do list. In short, it took about 7 seconds for me to go from sad to excited. I’ll move on to other projects on my list and do the simple work of saying, Look what Katie made! Her eCourse is more amazing than I could have, would have created. It’s thorough but basic, detailed but simple. It covers every age group and cooking skill level from beginner to intermediate to advanced. It includes 45 professionally created videos, 2 recipe eBooks, and 250+ pages of downloadable material, flash cards, and lesson plans. So Malachi, who still fits in my lap (barely), has been joining me at the computer where we are working our way through the Kids Cook Real Food course. 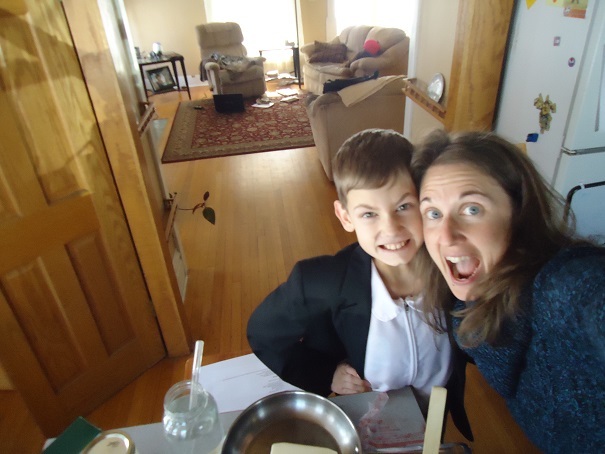 Inspired, we head to the kitchen to take selfies. We’ve also gotten to work on Malachi’s kitchen skills. 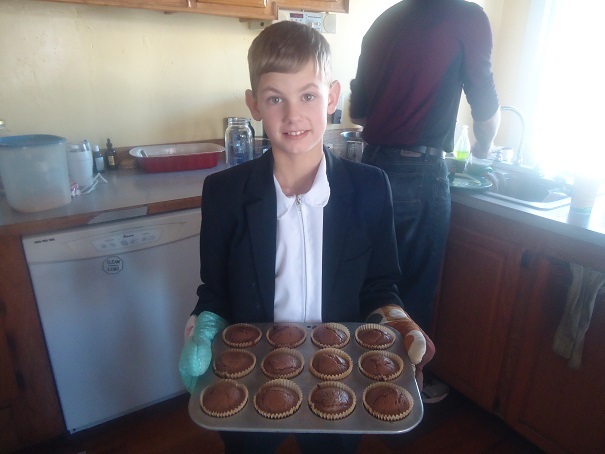 From start to finish, this kid turned out a double batch of his favorite Chocolate Chocolate Chip Muffins (while his hot stuff dad rinsed some dishes). 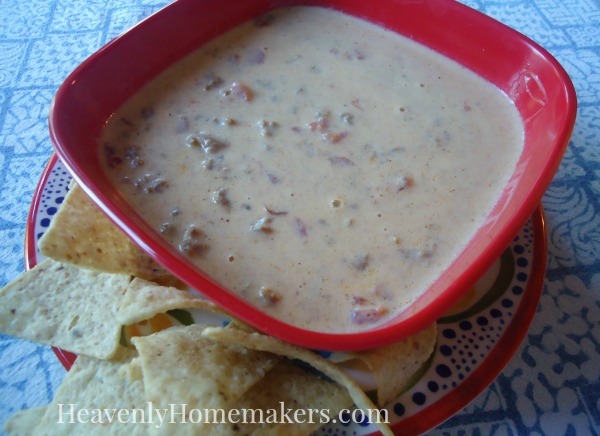 I fully intended to give a shout out for the Kids Cook Real Food course earlier last week, but cream cheese and rotel bulk purchases detained me. So you should know that today is the final day to sign up for the class. It’s rockin’. Work yourself out of a job while your kids take over your kitchen and find themselves prepared for cooking success in the future. Saturday morning we headed out the door while it was still dark for basketball games out of town. I made Ham and Egg Breakfast Bowls to go with Malachi’s muffins. There were only four of us home at the time, so only making 9 Ham and Egg Bowls seemed really strange. 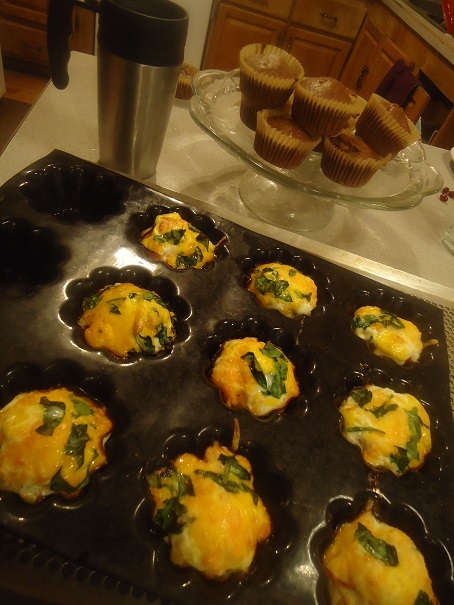 The picture quality is terrible since the kitchen was fairly dark, but I highly recommend you checking out this easy breakfast idea. 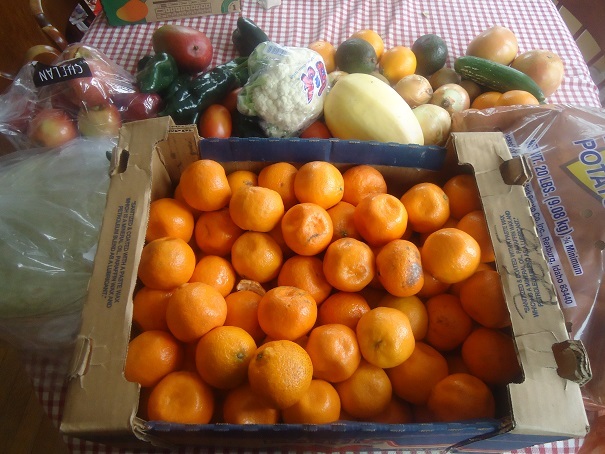 We arrived home to our wonderful Bountiful Basket order which had been dropped off by a sweet friend. We are so set for this week!! Would you believe, after all these grocery purchases, my brain actually had the audacity to think, “What do I need at the store?! ?” when it started snowing heavily on Saturday night? I must be crazy. Relax, Brain. I’m pretty sure our family can eat for months with all the food we have on hand right now. Getting snowed in would not be a problem. As it turns out, it snowed beautifully but we are not snowed in. It takes a lot to keep a Nebraskan from getting out and about after a big snow. Do you get to shop at Aldi often (or ever)?? Aldi is one of my hands-down favorite stores. Shopping their enables us to be able to eat well (not just rice & beans) on a really tight budget. I think I would go crazy having the nearest Aldi be an hour away! I am so blessed to have 4 within 20 mins of me. I hope you get an Aldi nearby soon! I love Aldi! I not only do a lot of my own shopping there, but also shop for our parish youth group’s fundraising dinners there and always get compliments on the food. We have no Aldi on the West Coast. There are several Aldi stores in Florida. My mom lives in Bonita Springs and they are getting a new one soon. I love Aldi too. It reminds me of shopping in Europe. Fewer choices. 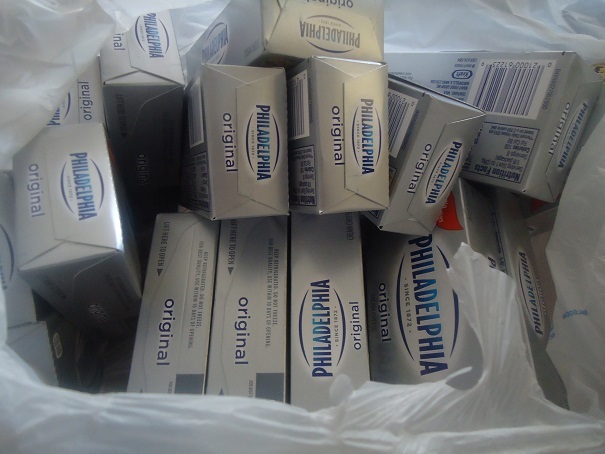 Unfortunately, Philadelphia cream cheese and are not friends because of the concentrated why protein. I get an MSG reaction: headache , fatigue .Happily the store brand does not have it . Sorry, whey protein not why protein. I try to shop once every two weeks. Aldi is my first shop, where i fill my cart to the brim for less than $100. It always astounds me. After that I cross the street (literally) to Costco for my Costco purchases. Then I am left to go to a regular store for a few odds and ends. I love Aldi, and they are a great company (Costco too!). I am happy to spend the bulk of my grocery budget at those two stores. Yes we got one in my town last september. Its my first stop when I grocery shop. You never know what kind of the deals you are getting. This week I got grapefruit for 10 cents. Milk 1.58 gallon. Never been to an Aldi! I constantly read about it and it’s great deals! Boo-hoo! It’s the trade off, I guess, of living in the beautiful state of Montana! Our Aldi stinks. The produce is so small that I would need to buy double the amount negating any savings. 99% of Aldu products do not have real food ingredients in our area. I try to stay away from non-organic canned tomatoes as they may use chemicals to peel off the skin. What is Aldu? I meant Aldi. Same here with our Aldi. I prefer to shop at Azure Standard and fill in the rest locally. We do try to buy mostly organic whenever possible and our Aldi just doesn’t carry much if any. I buy beans and tomatoes by the case at Aldi! We live 85 miles away from Lincoln, but we are there several times a month for appointments and to visit my family. I have found that where we are, the selection at the small grocery stores nearby if you can consider 20 miles near!) is small and expensive. Aldi has organic options for cheaper than normal ones at the other stores….I also buy butter by the case there! I usually fill the trunk and back seat of my car each shopping trip, but I am feeding 8 people, 6 of whom are boys/men! I love your comment on the pizza. As I’ve told you before, you are living our life! We went “easy” on a pizza meal a couple of weeks ago and I used ‘boughten’ pizza dough. We had the same reaction you had. It was so-so. Cracked me up to read you say the same thing. You’ve ruined us Laura! No store-bought food or restaurant food can compare with REAL home cooked food. Homemade pizza… can’t be beat! As for Aldi… yes and yes!! We, a family of 8, shop there for about 1/2 or less the cost of other stores. We start there and fill 2 carts for 2 weeks of eating. We finish up with Walmart and can stay on the budget of a small-town pastor’s family. Praise the Lord for it! I live in Southern New England and have been shopping at Aldi for about three years, I think. I generally shop there weekly, and based on my Quicken entries, I think it accounts for about 60-65% of my grocery shopping. I get lots of produce there (organic bananas, carrots, baby spinach, and weekly specials), and basic staples like butter, organic milk, and Greek yogurts for my husband’s lunch. Organic coconut oil is also very reasonable there. Oh, and last summer, I pretty much bought organic red grapes and strawberries weekly. I also buy their antibiotic and nitrate free lunch meats and chicken. Glad you had a good trip. I love shopping the deals at Aldi and this week has been Mexican food week there. I got my college son onto it and he just got his room mates onto shopping at Aldi. I love Aldi’s. It is 45 min to 1 hr from me so I only go when I make a trip down there. I am enjoying a juice sparkler right now – sparkling water + mango passion juice – the mango passion juice really is 100% juice! they tell me people drive miles to get this wine. I also like the fact that you can get some good deals on non grocery items. I bought a new card table and 4 chairs for $49.00 now that is a deal. It was a Cosco set. I love Aldi. I recently moved to South Carolina and there is not an Aldi within hours of me. When I was 10 minutes away from Aldi in KY I shopped there every week and would stock up for half the price of other chain stores. I miss Aldi so much and I definitely see the price difference without one near. I shop at Aldi every week! Luckily we have 3 close by. I try to plan our meals around the food Aldi sells. I was at Aldi’s just yesterday shopping. The funny thing is that it is the exact one you were just in! I live in Lincoln just about a mile south of the Alid’s so I am trying to do more of my shopping there. I’m still learning their prices and selection and we are trying out their brands to see which we like and don’t. I’ve shopped at Aldi’s in several different locations. Although their applesauce is less expensive than W-Mart, it is watery, and lacks a great applesauce texture. I was disappointed to find their Dakota brand of baked beans was mostly sauce compared with Bush’s baked beans. About three years ago, I needed to make a meal for someone, so I went to Aldi’s since I was told what a wonderful place it was. I specifically needed tomato sauce and chicken broth for a soup, I purchased their brand of tomato sauce and their line of Fit and Active Chicken broth. The soup tasted awful…although it’s one I make many times using other brands. The soup was thrown away and I remade the soup using my regular brands. Their chicken broth was so watered down I would hardly call it broth! One store is 18 miles and the other is 22 miles away, so I won’t be shopping regularly at Aldi’s. Our closest store is about 45-50 minutes away. I love to shop there but end up doing it much the same way you did, we buy cases at a time. I wish there was an Aldi store closer to us, but our town is probably too small for them. During blueberry season you can get them for $1 per pint. They also offer meat deals on Wednesdays. What a great store! I have 4 Aldi stores close by, depending on which way I am going. I love Aldi. The selection of organic, non GMO, no HFCS, etc. continues to improve and their prices are great. They often have a good selection of nongrocery items, too. We shop at Aldi almost once a week. I buy almost all my groceries there now. They have added a lot of organic products and their milk and eggs are hormone free! My mother stocks up when she visits and has written the company many emails and letters trying to get a store near her – she now has one about an hour away near my sister. If your store is not carrying the organic brands you should talk to the Manager. I can’t tell you how much money we save shopping there! We have Aldi in California now ( 2017 was the first time i saw them) i love aldi its 30 min away but just blocks from my work another store we have is winco and between the two stores i don’t have to go anywhere else.